Iwerks, Ub (1901-1971) Animator and special effects wizard. Born in Kansas City, Missouri, in 1901, of Dutch extraction, he had his first major job with the Pesmen-Rubin Commercial Art Studio, where he did lettering and airbrush work. It was there that Ub met Walt Disney, another aspiring artist. Both boys were 19, and when they were laid off, decided to set up their own company to do commercial artwork. 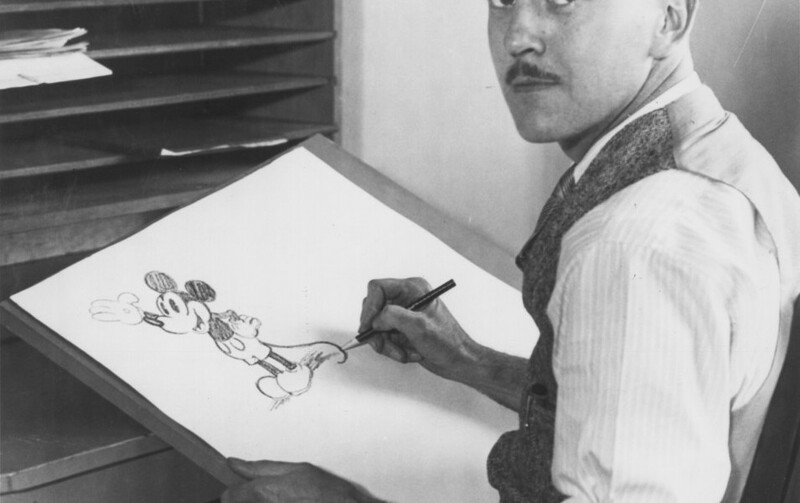 The company, established in 1920, was called the Iwerks-Disney Studio. Originally they had thought to call it Disney-Iwerks, but that sounded too much like a place that manufactured eyeglasses. The Studio only lasted a month, but then both Ub and Walt were able to get more secure jobs with the Kansas City Slide Company, later known as the Kansas City Film Ad Company. When Walt set up Laugh-O-gram Films in 1922, Ub joined him as chief animator. This company also lasted only a short time. Walt went to Hollywood to begin producing Alice Comedies and Ub joined him there in 1924. Ub’s starting salary was $40 a week, higher even than Walt’s, attesting to his importance. Several years later, when Walt lost the rights to Oswald the Lucky Rabbit, it was Ub who came to his salvation by helping him design a new character–Mickey Mouse. Ub animated the entire cartoon, Plane Crazy, all by himself. He worked at a tremendous speed. Ub was renowned for doing 700 drawings in a day; today a proficient animator turns out about 80-100 drawings a week. The Gallopin’ Gaucho followed, then Steamboat Willie, the first Mickey Mouse cartoon ever released. Ub continued animating on the Mickeys and also painted the backgrounds and drew the posters. When the Silly Symphonies started, he took over direction of them. Because of disagreements over production techniques and a desire to set up his own studio, Ub left Disney in 1930 for ten years. By the time he returned in 1940, he had decided to leave animation altogether and turn to his first love, cameras and special effects. One of his first inventions at Disney was the multihead optical printer, used so successfully in the combination of live action and animation in Melody Time and Song of the South. Of tremendous importance to animation was Ub’s design of the modified Xerox process, whereby pencil animation drawings could be transferred directly to cels without the more expensive hand-inking. Over the years, Ub won two Academy Awards, for designing an improved optical printer for special effects and for collaborating on the perfection of color traveling matte photography. Ub’s inventions helped make the impossible possible and Disney screenwriters and art directors kept this in mind. It was primarily due to Ub that the Disney Studio moved to the forefront in special photographic effects. Disneyland and Walt Disney World occupied much of Ub’s technical attention in the 1960s, including such attractions as “it’s a small world, ” Great Moments with Mr. Lincoln, and the Circlevision 360 process used in America the Beautiful. The design of the film process for The Hall of Presidents at Walt Disney World was Ub’s last project. He was honored posthumously with the Disney Legends award in 1989. Ub’s sons Don and Dave were longtime Disney employees. Ub was a quiet, unassuming man, who was devoted to his work, making his mark not only in animation but also in the field of motion picture technology. He was an animation genius, perhaps the greatest of all time, whose contributions to the art in the 1920s and 1930s helped make animation much more appealing to a wider audience. A documentary on his life, The Hand Behind the Mouse: The Ub Iwerks Story, was produced by his granddaughter, Leslie Iwerks, in 1999.